Today’s technology brings us many advantages when we are looking to travel light. This is especially true with GPS navigation. 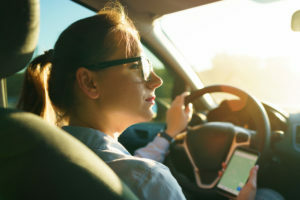 With the on-set of smart phones, most people have transition from dedicated GPS systems; such as the in-dash systems in our cars, tom-tom or Garmin and now are using their cell phones. This is fine, if you’re data plan and your phone work with a GPS navigation system, but not all plans and phones support this type of heavy network traffic, or maybe you just want to save money. Clearly, for getting from point to point today’s GPS systems like Waze; that use other people’s drive time to help you navigate; or Google maps that uses other traffic information clearly are focused on getting you from point A to point B as efficiently as possible. The systems are best used to quickly get you where you want to go while avoiding as many unnecessary hassles as possible. Beyond the fact that they have certain limitations, they serve a real purpose. But… there are times when these systems don’t actually work to your advantage. You want to take a more scenic route. You want to avoid a city or other known problems. You want to create your planned navigation route before you leave. You would like to set up way-points (stops) along the way. You want to wander off the systems chosen route. You lose cell phone coverage. Every one of these have created a significant problem for my wife and I as we have traveled over the past few years. I’ve tried to use Google maps, Magellan’s way-points, pre-saving destinations in Waze and inevitably each one comes up short. 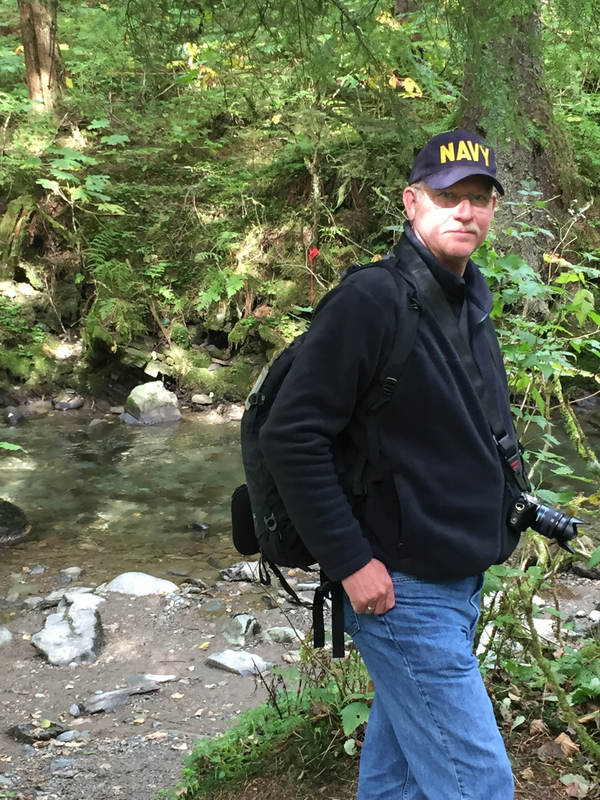 If you’ve ever want to get off the beaten path, drive through a scenic town, drive along the lake, or the ocean, then you are familiar with the term “recalculating”. When it comes to travel, I like planning ahead. That means that I like looking at the things along the way to our destination to see if there are interesting stops or things we would like to see. Originally, I stored all this information on paper, that required my traveling partner; otherwise known as my patient wife; to constantly put in new GPS destinations. This was only met with frustration because inevitably the GPS system wanted us back on the interstate, or some other faster route. 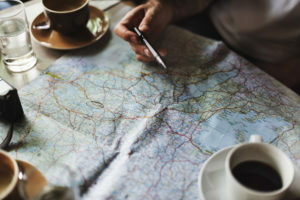 As my travel planning got to be more sophisticated, I started using Microsoft OneNote, by doing this I was able to preset up the information to copy into the GPS system. Then on our Leaf Peeping Tour we ran into another major problem i.e. poor to no coverage in Northern Vermont, New Hampshire or Maine. We were back to Maps, thanks to AAA we had those too. The next serious challenge is international travel, not only are data plans very expensive, but you run into the same problem of coverage because of different cellular companies cover countries differently. Run on my smart phone or tablet – totally off line. Able to download maps only for the countries or states I wanted to travel in. Cheaper than buying a dedicated GPS. Able to set way-points in advance. Create route plans on multiple platforms, i.e smart phone or tablet, and share between devices. WiFi based so I could do updates at night or at lunch if our plans change. Be able to handle complicated navigation in Europe, like multiple round-abouts. By focusing on these requirements I was to able to identify a few candidates. None were free… but you get what you pay for. The real deal breaker was; do they work in Europe? Let’s face it our roads aren’t great; by world standards; here in the states, but they are far more straight forward for navigation than the roads in Europe. Fortunately, a number of phone based GPS systems allow you to load them on your phone initially for free, which is what I did. I then took these apps on a road trip down to Washington DC. Anyone that has lived or visited DC knows that DC is one of the most difficult cities to navigate in the US. 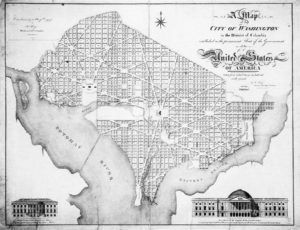 You might not know this but DC was originally designed to be difficult to navigate. The original architect Pierre Charles L’Enfant felt that it was necessary to confuse foreign armies if they tried to invade the capital. Anyway, between DC’s constantly changing roads, road closures due to visiting dignitaries, and other government functions, with a few roundabouts thrown in, the list thinned very quickly. One word of cation, like in Europe never set your navigation point to “city center” unless your know that is where you want to go. Twice in Italy we ended up inside walled cities, where only residence were allow to enter. Woops… you don’t want that ticket going to your rental car company. Some of the reviews we found most helpful were “Wired – Top 4 off-line GPS Systems”s and iTunes GPS reviews. Turns out Sygic roots are based in Europe, it allows me to set up multiple way-points, and I can download the maps I need for off-line use before the trip. Let’s face it until you have seen what it cost for cell phone coverage during international travel (albeit travel to Canada and Mexico is now better) or worse, got the bill when you used too much data, you may not understand this prime motivation. It’s field tested, I mean, we have travel over 8 weeks in Europe and with one small exception we’ve never have a problem (I think that may have been our; I mean my error). The turn by turn and audible instructions are very clear and timely, especially with dealing with complex round-abouts. Lifetime subscription and updates for map. Speed limit warning and safe turn speed – comes real handy in the mountains. You can add nighttime heads up display for a small fee. Because this is smart phone based app you must have a smart phone that has adequate memory, for example our next trip to SE Asia requires 5 GB of memory for the maps on my iPhone, since I have 64 GB its no problem. This should also not be a problem for Android phones that can add an extra memory card. Next make sure to bring a lighter type charger, as navigation apps are very battery draining. Don’t forget your cables, make sure they are long enough. We include a audio extension cable that can plug into and RCA earphone jack in a car… a lot of rental cars still do not have Bluetooth. Bring a “small” dash or vent mounting phone holder. 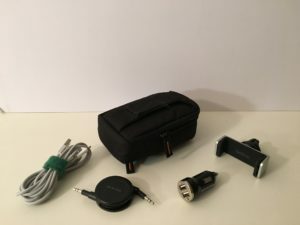 Last, this gear can easily be kept in a small electronics accessory bag so it stays together and can easily be grab as you pick up your rental car. One other side Note: Sygic has just added a couple new apps to their portfolio, we are just reviewing them so we’ll keep you posted. Last, you should know is we are not getting any affiliation fees, etc. This is just good old fashion, happy customer sharing.